B uddhists from the Kagyu north west community travelled across the Pennines to Harrogate on May Day weekend for a very special teaching by Lama Jampa Thaye on the Songs of Milarepa. Milarepa, a renowned meditator and poet who lived in the 11th century, was one of the founders of the Kagyu tradition of Tibetan Buddhism. 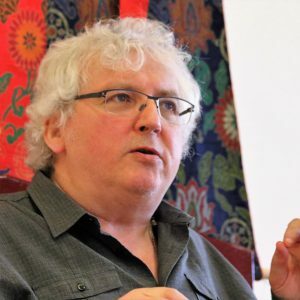 His life, Lama Jampa explained, is an example of the transforming effects of the dharma. Despite an early life blighted by misfortune, Milarepa went on to become a Kagyu lineage holder. The teaching focused on some of Milarepa’s beautiful songs – known as dohas – through which he shared his great wisdom, compassion and understanding. The songs are still a source of inspiration and guidance for Buddhists today, even though it’s a thousand years since they were composed. In the afternoon, Lama Jampa gave the initiation of Green Tara. Tara is revered as the embodiment of the liberating activity of all buddhas, and her initiation and meditation can help to awaken the innate capacity for enlightened compassion. The teaching was organised by Kagyu Dechen Dzong Buddhist Centre in Harrogate.